TOWARD A HOPEFUL FUTURE: Why the Emergent Church is Good News for Mainline Congregations. By Phil Snider and Emily Bowen. Cleveland: Pilgrim Press, 2010. X +290 pages. Emergent, emerging, postmodern – these are all terms that are bandied about in certain circles, but they may not carry meaning for many people in Mainline Protestant circles. This is unfortunate because many of those who fit under these rather loose labels share much in common with Mainliners. A majority of emergent and emerging Christians are evangelicals or post-evangelicals who share with progressive Christians concerns for social justice and societal transformation. They’re concerned about poverty, the environment, and whether or not they believe in an inerrant bible, they’re more concerned about living out the faith than defending it. It is true that there are many definitions of what it means to be emergent, emerging, post-evangelical, or postmodern. But what these definitions share in common is a growing dissatisfaction with the status quo. The Enlightenment has made its mark, but it has left many with a sense of great emptiness. Church growth, seeker services, mega-churches, conservative politics, have had an unsettling impact on many of these mostly younger Christians. They have much in common with Mainline Protestants, but they are also disenchanted with what they perceive to be a hidebound institutionalism and rationalism. And yet, with the right bridge builders, the two groups could come together, providing a natural home for Emergents and hope for the Mainline. At least, that is the belief shared by Phil Snider and Emily Bowen, two Disciples of Christ pastors who have embraced the Emergent movement and want to introduce skeptical and suspicious Mainliners to this movement. The emergent church movement is rather diverse, though it is often linked to such people as Tony Jones, Doug Pagitt, Brian McLaren, and Rob Bell (with a nod to the much more conservative Mark Driscoll). Jones and Pagitt have, for their part, been key leaders in a movement that continually challenges the status quo in both evangelical and Mainline communities. McLaren has made a name for himself by trying to define what he calls a generous orthodoxy. All of these figures, with the exception of Driscoll, can be called post-evangelicals. I personally resonate with this group because I am myself a post-evangelical, though I began my journey outward from evangelicalism before I ever heard of any of these figures. Like them I found the evangelicalism of my earlier years to be too constrictive both theologically and socially. One of the reasons why this group needs an introduction to Mainliners is that many in the Mainline community are suspicious of evangelicals. I experienced this reality, being that I was a graduate of Fuller Seminary. Fortunately this has long since dissipated. Still, the bridge that Snider and Bowen seek to build between progressives and Emergents should prove beneficial to the Mainline Church. The book begins by offering introductions and definitions. The authors point to several definitions, including that of Tony Jones, the former national coordinator of Emergent Village, who defines the Emergent movement as essentially a friendship or network of missional Christians. He notes that Scot McKnight, a friendly observer of things Emergent, suggests that emerging churches are prophetic, postmodern, praxis-oriented, post-evangelical, and political (that is, they are generally politically liberal evangelicals). Others would point to worship styles that seek to be both ancient and modern. There are in fact a wide variety of emergent types, which range from extremely conservative to relatively liberal. So, any definition is going to rely on adjectives. The version of the emergent church that Snider and Bowen link into is one that is open to progressive understandings. It’s one that seeks to listen for postmodern voices, is committed to social justice, is progressive in theology and expression. Snider and Bowen are attracted to the emergent perspective because it is organic and grass roots. It allows for freedom and nuance. Of course, being progressive Mainliners, the authors are very aware that most of the emergent voices are white and male. Of course, the charge of whiteness can be laid at the feet of most mainline Protestant churches. The book is divided into three parts – Emergent Background, Emergent Ethos, and Emerging Worship. Through these three sections the authors introduce mainline progressives to the emergent movement and offer suggestions as to how this movement can enhance and empower and give hope to mainline churches. They do a good job of telling stories of people who have felt disenfranchised by both evangelicalism and Mainline Protestantism, suggesting that this movement can provide resources to transcend these difficulties. In part two the sections on justice and hospitality should prove especially helpful. Emerging forms of worship are much more concerned with grounding worship experiences that reflect specific contexts and theological convictions than they are with any specific style. (pp. 139-140). That is, the question isn’t whether we should have old hymns or praise songs, organs or guitars, debates that have colored the so-called worship wars. But, the authors remind us that younger adults are more visual and kinesthetic in their orientation to worship. This is why many forms of emergent worship include candles and icons. 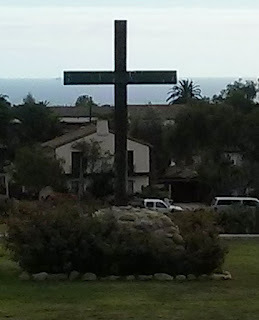 In reaction to the seeker movement that removed Christian symbols from the worship space, Emergents have not only brought back the cross, but other visual forms – including icons that derive from the Eastern Church. Technology helps in all of this, but isn’t essential or normative. [W]e hold fast to progressive approaches in general by making sure the music is grounded in nonviolence, justice, hospitality, and mutuality, and we try our best not to lose sight of the mystery and wonder of God. Like emergents in general, we focus on music that is neither highly individualistic nor concerned with pie in the sky. In short, we try to make sure that every element of the liturgy – especially our music – reflects the theology held dear by progressives and emergents so that they can joyfully sing their faith without sensing a bunch of disconnects in the process. More than anything else, it is the music that stays with the people, it is music that seeps into their bones and reimagines their world. (p. 172). In two appendices, the authors offer more guidelines and examples of how one might construct an emergent worship experience. Being that they are Disciples of Christ, they place the celebration of the Lord’s Supper at the center of this worship, and they make a point of the fact that Disciples do not limit the celebration of the Eucharist to clergy. 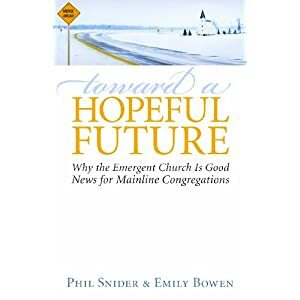 Bowen and Snider have written an important introduction to emergent Christianity for progessive Mainliners. They create a bridge that will help the skeptical or suspicions deal with qualms and questions. The emergent movement isn’t a perfect vehicle, but it does offer hope to the mainline church with its deemphasis on institution and structure, while emphasizing tradition, justice, scripture, hospitality, and adaptability. The emergent movement isn’t the end all for mainline renewal; any more than was true of the seeker movement or the megachurch movement. The danger here is that a tradition that is experiencing both decline and an inability to reach younger generations will simply jump headfirst without truly understanding the ramifications. The reality is that even if the emergent movement offers a word of hope, each church will have to adapt itself in a way that is authentic to its own context and history. That being said, this book, and this movement, does offer a pointer toward a hopeful future. Scripture games, eh? How about this? "Do not judge, so that you may not be judged. For with the judgment you make you will be judged, and the measure you give will be the measure you get. Why do you see the speck in your neighbor's eye, but do not notice the log in your own eye? Or how can you say to your neighbor, 'Let me take the speck out of your eye,' while the log is in your own eye? You hypocrite, first take the log out of your own eye, and then you will see clearly to take the speck out of your neighbor's eye." Matt 7:1-5. Scripture is not a game. Are you intelligent enough to understand that by accusing me of judging, you are judging me? Can you explain why it is ok for you to judge me, but wrong for me to judge anyone? Before this conversation gets too far off track I think I need to step in. This is an important book for Mainline Christians to consider. I'd rather not get into a debate as to who is judging whom! I'm surprised that there was any room for my comments given the staggering number of people leaving comments about the book! It is no defense against judging to argue that others cannot call you out on your judging because that too is judging. If you deny you are judging just say so. If you are judging then my quote is well directed. As for the game of allowing biblical quotes to substitute for a genuine comment, I suggest that is not useful. Who is blind and why do you say they are blind?